With starting of New Year 2013 LIC has launched new plan New Jeevan Nidhi. LIC’s New Jeevan Nidhi Plan is a conventional with profits pension plan which provides death cover during the deferment period and offers annuity on survival to the date of vesting. In short it is Pension Plan. Along with this plan LIC has also launched plan called as Flexi Plus which is ULIP. 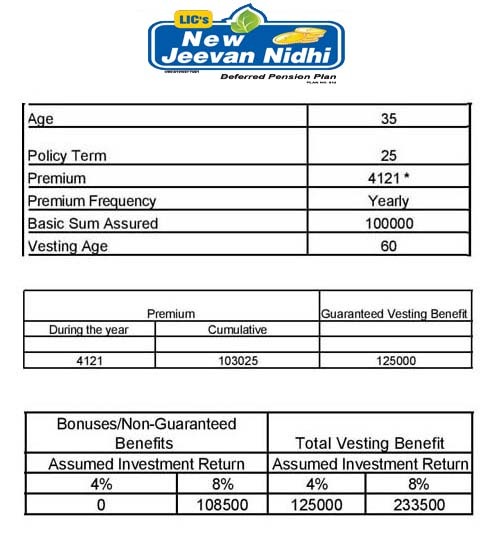 Let’s Review LIC New Jeevan Nidhi. On vesting an amount equal to the Basic Sum Assured along with accrued Guaranteed Additions, vested Simple Reversionary bonuses and Final Additional bonus, if any, shall be made available to the Life Assured. On vesting life assured has two different options one is to purchase immediate annuity plan or to purchase new single Premium deferred pension product from LIC. One can commute the amount available on vesting to the extent allowed under Income Tax Act. The entire amount available on vesting or the balance amount after commutation, as the case may be, shall be utilized to purchase immediate annuity at the then prevailing annuity rates. Death after first five policy years: Basic Sum Assured along with accrued Guaranteed Addition, Simple Reversionary and Final Additional Bonus, if any, shall be paid as lump sum or in the form of an annuity or partly in lump sum and balance in the form of an annuity to the nominee. Looking at above benefit illustration taken from LIC site one can clearly indicates that this policy does not value for money. If you purchase this policy at age of 35 year for retirement age 60 for basic sum assure of 100000 Rs/- you need to pay yearly 4121 Rs/- yearly (service tax extra). Cumulative amount you will pay is 103025 Rs/- & Guaranteed vesting benefit as per LIC will be 125000 Rs/-. Non-Guaranteed benefit depends on LIC performance and it will be zero if projected Investment Rate of Return that LICI will be 4% throughout the term of the policy. Annuity payable (per annum) for life based on the total vesting benefit given above are 11688 Rs/- considering 4% projected investment rate of return and 22533 Rs/- considering 8% projected investment rate. LIC New Jeevan Nidhi does not value for money and may end up providing you low investment return. On vesting customer need to purchase immediate annuity plan or single premium pension plan from the LIC. This plan reminds me about HDFC Life Pension Super Plus. In this case you are stuck with same insurance company after vesting. Risk is involved in terms of projected investment return by LIC, if LIC end up generating return less than 4% vesting amount will be like peanuts. I could not find any extra benefit coming out from this policy apart from life insurance. 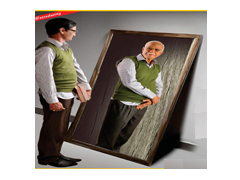 If retirement is only goal you can plan to invest your money in better option like PPF, mutual funds SIP or even FD. We don’t find this plan that attractive it is better to stay away from this plan. In my opinion this policy does not seem very interesting.It would be better to invest in PPF. They said in example that you are not entitle to receive any amount as bonus if projected investment rate of return by LIC will be 4%. I am unable to understand why bonus on 4% assumed investment return is Zero?